well iv now tried cometic and HG head gaskets in my almost factory ls/v any advice on what head gasket to go with next? i was told that cometic was one on the better choices but seem to me the HG (oem honda) lasted longer. it the block decked or head milled at all? i would say get both surfaces checked and in spec and then a new honda headgasket if you can, cometic if you require a bigger bore. but also almost every ls/v setup that i have had an experiance with has had or does have a blown hg (leaking oil) problems. What head gasket are you using? LS or B16/GSR? gsr and i am running 13:1 comp.. I am running an OEM B16 HG on my 81.5mm LS/V setup. It is on a 9.0:1 engine making a little over 500 to the wheels. I have a crankcase ventilation setup on it, and I am using GE dowel pins and ARP head studs. No blow by, oil burning or overheating on a stock sized radiator, oem fan, oem thermostat and oem fan switch. Sounds like you either have a problem with the surfaces or a problem with crankcase pressure. What cams are in it to support that compression? running itr cams and the crank case ventilation was going to be my next step wrenches in des moines put the engine together and had there choice shop do all block and head work. That definitely will not hurt you. If you are running a b16 or gsr cam, that is definitely building a lot of pressure. anybody have some good designs? 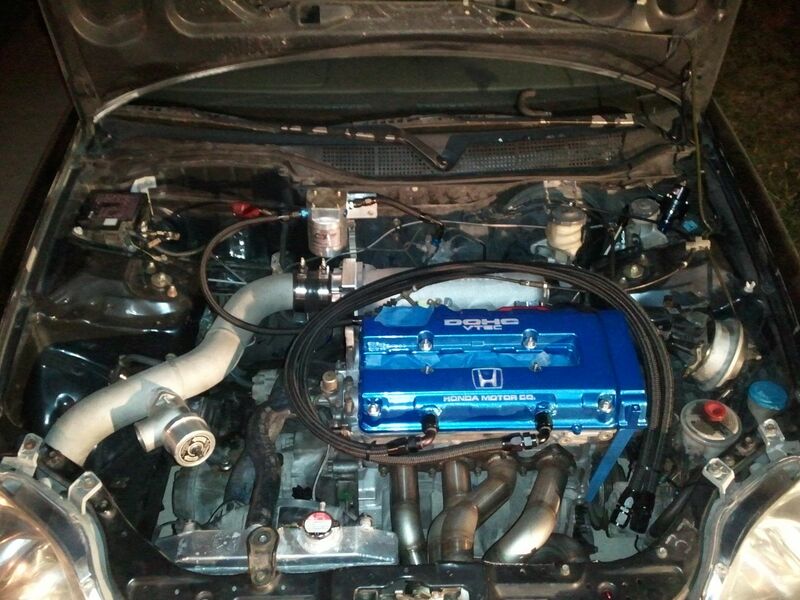 Hard to see, but I have mine plumbed off the front of my valve cover. They are weld on bungs running in to -10 line. I do not have my catch can installed yet in that picture. Here is a link as well to a good thread on Honda-Tech. http://honda-tech.com/showthread.php?t=1970101 56 pages worth of decent pictures. r u runing any return lines? I do not run any return lines. Between the larger lines basically just moving the pressure and no oil, and the fact that I am running E85, I don't want any of that oil to make its way back into the engine.